Fordham has a big match up tonight with the Lehigh Mountain Hawks on the road and one player is becoming a huge force under the basket. That is Mr. Ryan Canty. The big man from Massachusetts played minimal minutes last year due to fouling issues. He would enter the game and pick up two fouls in 3 minutes and would have to go right to the bench. This year however, is a new year and Mr. Canty is asserting himself offensively. Many alumni and fans were disappointed at Canty’s performance last season but I saw it as a stepping stone. He was a highly touted recruit coming in as a high energy, good rebounding, high-flying big man. Now that we are into the month of December, we are starting to see a lot more of why he can be so dominant on Fordham’s roster. In his last two games, Ryan has averaged 14 points, 7 rebounds, and two blocks. In the Manhattan game he has shown that he can hit the offensive glass and be a force in the paint with put back layups and dunks that not only ignited his team but got the crowd on their feet again. He finished that game with 18 points and 5 rebounds. 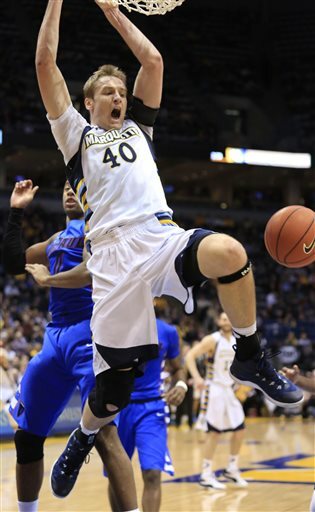 Then against Harvard, he hit the glass more and hauled in 9 rebounds and chipped in 10 points in the starting role. The aggressiveness he shows when grabs a rebound cannot be taught and that mindset has allowed him to put up these productive numbers the past two games. The only thing Ryan needs to learn is to not pick up silly, ticky-tacky fouls. Ryan only played 13 minutes in the Harvard game due to fouling out and that cannot happen in the next few games. He needs to try to control a lot of that high energy and play aggressive but within his limits. His recent play right now is too valuable to the team right now and he needs to play more with his feet and not with his hands. The more the big fella can shuffle those puppies, it gives the Rams a better chance to win a ball game. I like that this is a coming out party for Canty. Many lose sight when production goes down in a player. But now that the beast is unleashed, Fordham needs to take advantage of his production and his skill set and execute it into tonight’s ball game. Everyone remembers how effective Kervin Bristol was defensively and offensively on this Rams squad last season. I think Ryan learned a lot from his predecessor and has used that knowledge to display it out on the floor this season. Now that I see this production from #42, Alley-Oop passes need to be thrown his way, passes need to be thrown inside the post a little more often to set up the big guy for an offensive rebound if needed, and opponents need to start getting scared about defending the paint and worry that Ryan can take over a ball game. 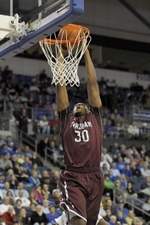 Tonight will be a big test for Ryan and his Fordham squad because Lehigh is a very good Patriot League team with Senior All-American guard C.J. McCollum leading his team with 25.7 points per a game. Let’s see if Ryan mans the center position for a lot of minutes and provides a double-double and a spark in Fordham’s spirits to earn a nice road victory tonight.